This baked ham with spiced apples and pears recipe is the essence of Christmas and holiday food. It is substantial enough for frosty nights and made with maple syrup and orchard fruits. The recipe fills the house with an irresistible aroma as it bakes and browns. This maple baked ham is the full holiday experience in one dish: sweet, smoky, salty, and spicy flavors blend to make an intoxicating and unforgettable winter meal. Serve the ham on the Christmas or Thanksgiving table and expect guests to be wowed because they will be and you will be so proud. 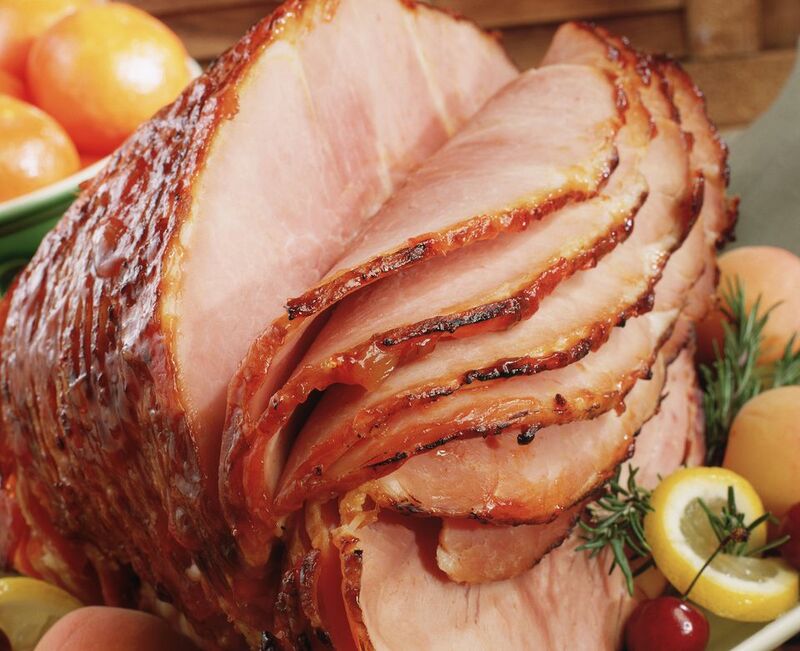 The ham can be served as a main meal, or as a sandwich, or on the buffet table for guests to help themselves. France was not always renowned for baking hams at Christmas, blond (boiled) ham is more common but it seems the British and American custom has also started to take hold and not to be dismissed. Using kitchen twine, wrap the ham first vertically, and then once on each diagonal, making sure to loop around the bottom of the ham, to hold it together. Place the ham in a large, deep roasting pan, cut side down. Dissolve the dry mustard in the 1/4 cup water. Stir the mustard mixture into the brown sugar, maple syrup, cinnamon, cloves, and allspice. Brush the maple glaze over the surface of the ham. Arrange the apples and pears around the ham and bake it, uncovered, for 1 hour and 40 minutes, basting the ham and fruit every 20 minutes. Loosely tent foil over the ham if it appears to be browning too quickly. Allow the ham and fruit to cool down slightly before removing the twine and serving warm or at room temperature. The baked is lovely on a lunch buffet and can also make a substantial dinner (see serving options below). Any leftover ham is also delicious sliced and popped into a baguette as in the Jambon Beurre famous French sandwich. You may want to not put the fruit on in this case. Option 2: Serve maple glazed ham with steamed or roasted asparagus spears, potato and onion gratin, sautéed carrots, and a country loaf, cut on the diagonal.ars, potato and onion gratin, sautéed carrots, and a country loaf, cut on the diagonal. This baked ham with maple glaze and spiced fruit recipe makes 10 to 12 servings. There is Only One Authentic Quiche, and it Hails from Lorraine.